I had the best time yesterday! I was able to meet up with Kerry from Kestrel Finds and Makes and Kristen of KristenMakes. We had such a delightful day starting out with tea at the The Dome in Edinburgh. 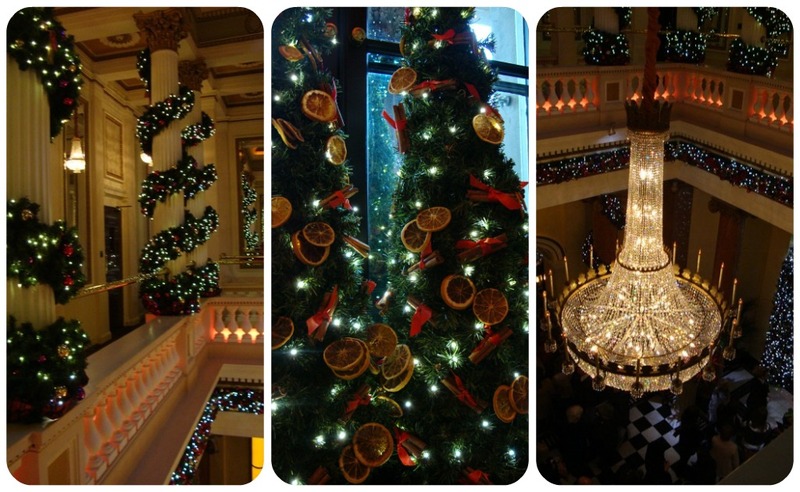 It is such a beautiful building right in the heart of Edinburgh--and it was completely decked out for the holidays. They even had the smell of cinnamon wafting in the air!! After our delicious tea (complete with sandwiches, scones and cakes), we headed to K1 Yarns Knitting Boutique. They had the cutest knitted loch ness monster and castle in their store window! After that we headed over to the vintage megastore Armstrong & Sons where I passed on some overly priced patterns but did come home with some underpriced yardage of wool!! We ambled through the Grassmarket area visiting several cute accessories and antique stores. Then we visited one of my favourite window shopping stores 'Fabhatrix'. Someday when I've saved up enough money, I'd love to get a bespoke 20's or 30's style hat made for me! Then we went to a new to me store--the Grassmarket Embroidery Shop! Such a fantastic resource for everything related to embroidery! 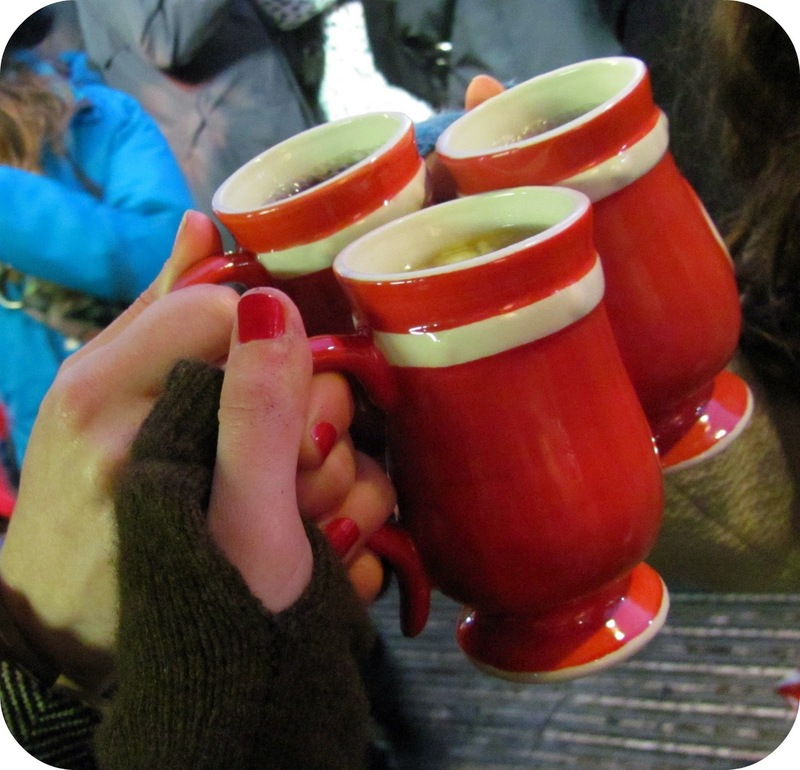 After that we headed over to the Edinburgh Christmas Market--where Prince's Street Gardens is turned into a winter wonderland complete with rides, christmas stalls and mulled wine! 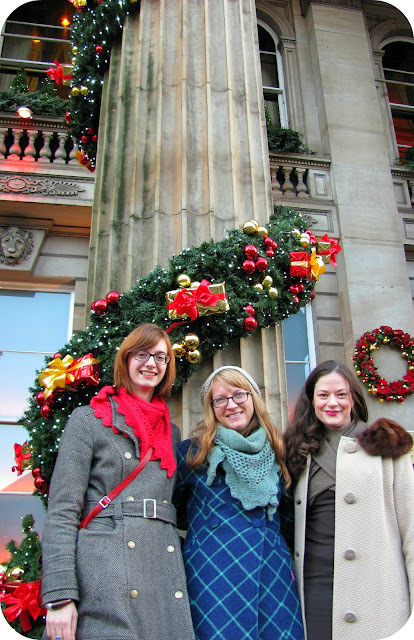 The three of us were talking about hosting another Scotland crafters meet-up on Saturday the 14th of January! We are calling it the Crafters' Ceilidh. We would love for you to join us! We are hoping to include a pattern/fabric/yarn swap, visits to local fabric and yarn stores and lots of sewing/knitting related blethering! Let me know if you are interested in coming and if Edinburgh or Glasgow is your preferred host city. We are hoping we can also entice a few of you from down south and across the water to come and join us as well! It was really fun, and I can't wait to see what you make with your fabric! Looking forward to the New Year meet up - either Glasgow or Edinburgh is good for me. Yeah yeah yeah, I'm up for it! Edinburgh better for me of course but Glasgow would be OK too. I'll post about this on my blog too, in case anyone wants to come! Now, in THEORY I should say 'no' because I'll be up in Glasgow a couple of weeks beforehand. And in THEORY I should say 'no' because I have a meeting that day. But in reality I am going to say, 'HELL, YEAH!' because it sounds like an amazing amount of fun. Can you let me know if and when that's a definite date and I'll start trying to squirm out of my meeting? What a great day, I loved looking at your photos! 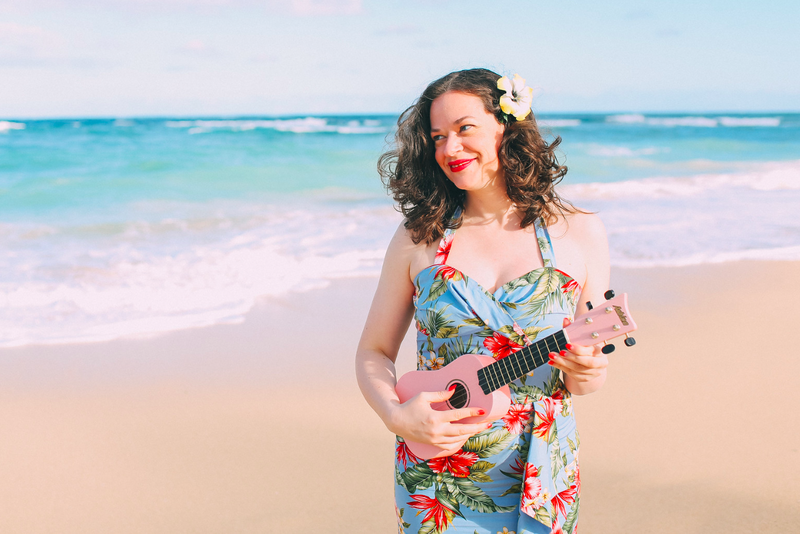 I'd LOVE to come, but I need to get real because I live in NZ - about as far away as you can be!! Seeing pictures like this really make me wish I lived in a city. I live in Cumbria so technically if I could get a baby sitter I could hop on the train ..maybe. I'd love to meet up in Scotland. I recently went to Glasgow so I'd prefer Edinburgh. But honestly, I would go anywhere. I had such a fun time out! I can't wait for our Crafters' Ceilidh, and am SO excited to see so many interested already! YAY! Both cities are the same train-length away, so I await your decision on that one. What an elegant group of ladies!! Gah! The Dome! The Grassmarket! Armstrongs! I am seriously missing Edinburgh right now!